Five weeks later Abbie and I boarded a train from East Kilbride to Glasgow to the beautiful port city of Oban. Fresh crab sandwiches sustained for the two and a half hour ferry that carried us to the small isle of Colonsay, population 100. We went to the local pub to get dinner and wait. The isle of Oronsay lay only a few hundred meters to our south and with every low tide the water separating Colonsay and Oronsay (called the Strand) dips beneath a rock passageway, thus becoming passable by SUV. So after dinner Val entered the pub, passed the locals betting on horse races and introduced herself. She was the director of the Oronsay conservation site and our ride over. We traveled with good conversation in bumpy complete darkness for about half an hour. When we got out, I experienced stars on Oronsay like I never had before – they were just over the treetops, three times brighter, and apparently each star had brought three of her friends to the isle. There was no moon out that night. So by starlight, quite clearly, we walked towards our cottage, past a ruined 14th century priory, half leaning because of a very spirited wind that had picked up. That night we snuggled close on our cot in the can’t-see-the-hand-in-front-of-face darkness. We were a long way from our rural mid-west American homes, bracing from the wind that thundered around the stone cottage, and thrilled to be living this adventure on the edge of creation. The morning welcomed us to an island of vibrant life – bright green grass, blue ocean, white sand, clear skies, blackish green ducks that quacked to each other outside our window, peacocks that called to each other further out, hundreds of geese that alighted in a nearby field, and in the distance sheep and cows that talked to each other about the new day. We enjoyed a basic breakfast with bottled water – the tap water not being pure enough to drink. Val and Stacey then picked us up for a tour of the island. We had missed Ben Oronsay last night, the formidable hill that provided the base for the farm and three houses that make up the civilization of Oronsay. 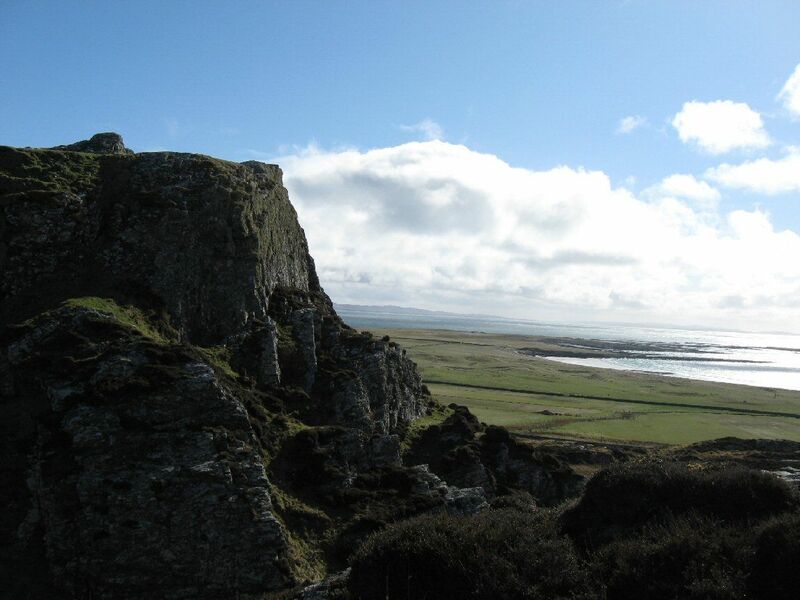 The small isle is owned by a lady who gifted it to the RSPB so that they might use it to care for endangered birds. To do this, Val and her husband, another couple who were off island for a bit and various interns and volunteers like Stacy and my wife I operate an intentional farm. The farm is about what you would expect in rural mid-west America – a good worn wooden barn, a stone tool shed/garage, several fenced in fields, a couple of tractors and sheep dogs. The only things that set it apart are the fact that you can see the ocean from most parts of the island and that the farming practices are slightly different. The native Hebridian sheep and cattle are kept out all year, providing manure that bugs eat, which in turn are hunted by an endangered bird called the chough. Modern sheep and cattle practices in Scotland have limited the amount of bugs available to the chough. So aside from providing wool and beef that help sustain the farm, the sheep and cattle form part of a stable ecosystem for a fellow creature having a rough time. 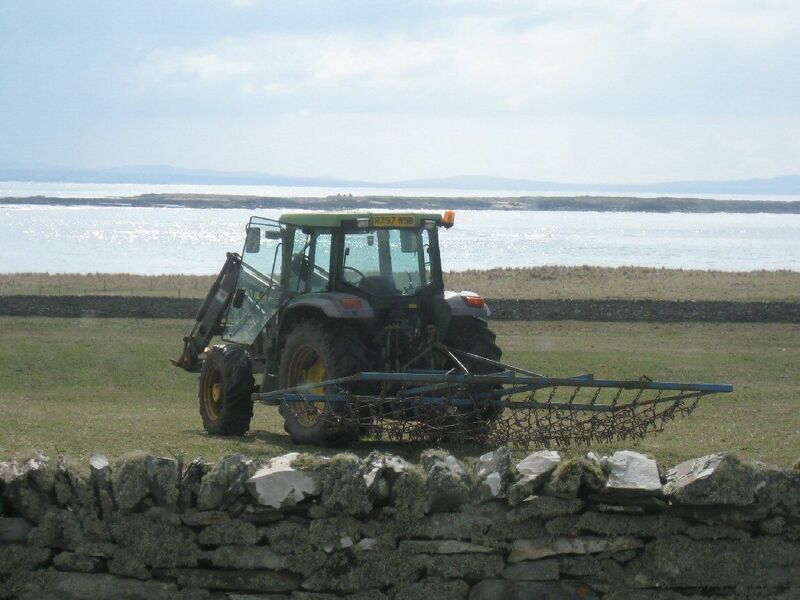 The island also harvests various grains, which along with valuable crops, provide the nesting ground for an endangered bird called the corncrake. Modern harvesting practices occur earlier and earlier in the year, often killing or displacing corncrakes before they finish laying eggs. On Oronsay, the farmers harvest late and slowly, from the inside out, allowing the corncrake to reproduce and escape and thrive. 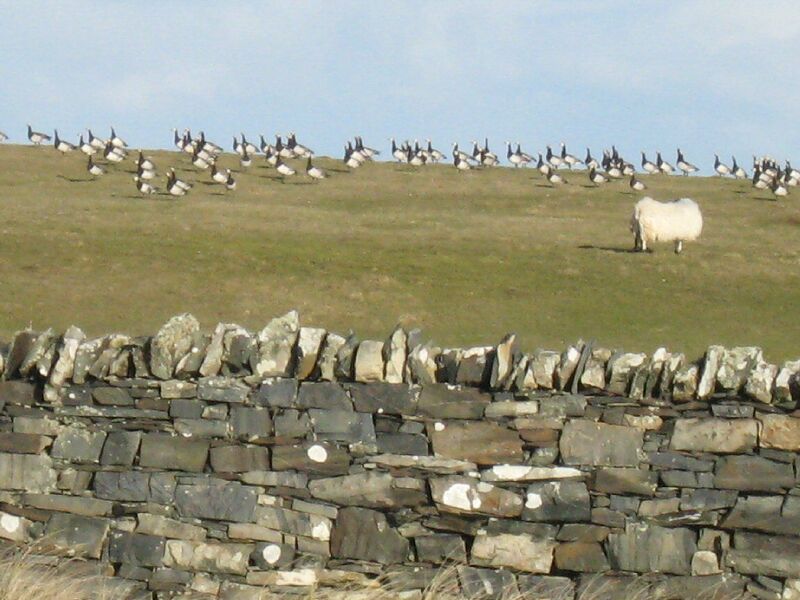 On Oronsay an intentional ecosystem is given form by a farm that gives two weakened species of bird a haven for life. Abbie and I were honored to be a part of it. Work was basic and good. In the mornings we fed sheep and cattle, helped build a fence, helped transport cattle off the island and salvaged some old wood. We usually had the afternoons off, sometimes walking the dogs, other times just walking ourselves. At night we slept incredibly well, Val had told us the fresh ocean air tends to do that the island’s guests. The first three days the strong wind was a constant. Then over dinner on that third day, it stopped. I walked out of the cottage to find a different island, peaceful and calm, calmer than anywhere I’d ever been. It struck me that there were no artificial lights, no road noise, the only thing to be heard was the ocean, with its gentle foot high waves hitting the beach. There was no rush, no advertisements, nothing crowded. The birds had found a good home. Exploring the island gave me memories I will never forget. Sheep trails led us up Ben Oronsay. From there we could see for miles, including almost all of the isle of Colonsay and the more distant neighboring isles of Jura and Islay. In between all of these isles was a brilliant emerald ocean. Hundreds of barnacle geese swarmed to and fro. On the coasts, we found layered rock clusters, sheer cliffs and on the west coast the most brilliant, pristine beach we had ever laid eyes on. It was spring break season, and we enjoyed the irony of being on a perfect white sand beach for spring break…wearing boots, scarves, gloves and stocking caps. We meandered around the calm beach, soaking up the harmony of the world we found ourselves in. Then and throughout the week we also spotted numerous birds, Stacey being kind enough to introduce us to each, letting us know their names and lifestyles. 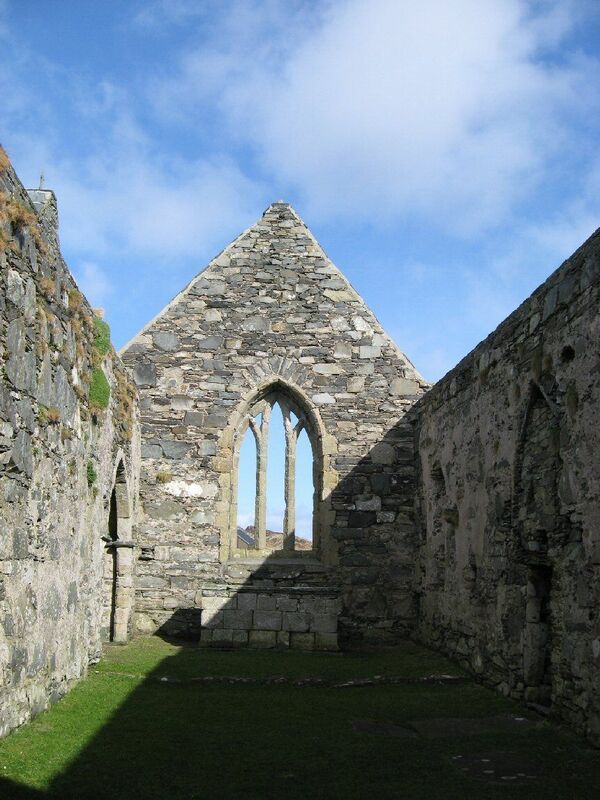 Back inland, the priory and its stone crosses dating back nearly a millennia gave us a glimpse into the roots of the island. 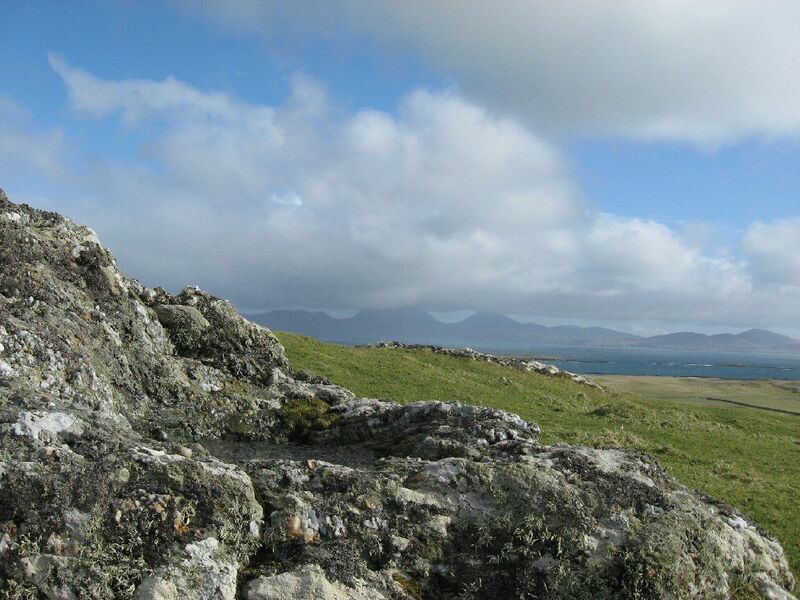 People had lived with the plants and animals of Oronsay for centuries. Many of the stone walls and all of the foundations of the priory remain. We walked through the residential parts into the sanctuary. 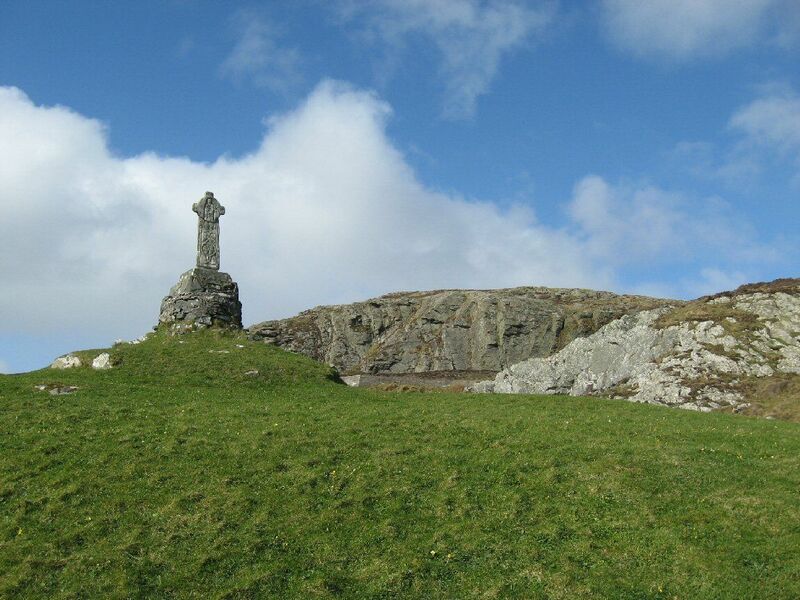 The stone cross, worn by the winds and rain, still bore witness to the Christian story. To see and touch the craft and faith of fellow humans from hundreds of years before I existed was humbling. It was all a breath of fresh air. We came from the loud, busy, modern city: disconnected from the myriad of plants and animals with which we share the world, surrounded by buildings and structures dating back 50 years perhaps. We came to a quiet haven, that subtly proclaimed the goodness of harmony with the earth, gently reminded us of the generations past, awakened us to see ourselves as being invited to play a small and privileged part of a very big and beautiful world story. There’s more to life than what we sometimes see in our busy world, and by serving our earth and fellow creatures, Abbie and I breathed this in, and we haven’t quite been the same since. I’m working to get my photos of the island uploaded…having technical difficulties. sorry and thanks for your patience.